Welcome to the U.S. Insurance Solutions Website! My name is Rob Tavis. I am the owner of U.S. Insurance Solutions. I want to welcome you to the website and thank you very much for visiting! As your Personal Health Insurance Advisor, my primary goal is to make sure that you have the best possible health insurance coverage for your situation and needs. These days health insurance is complicated...buying coverage on your own or from an agent who doesn't focus on health insurance can cost you time and money! At U.S. Insurance Solutions our full time focus is on health insurance! Begin by going to US Health Plans and seeing which insurance companies are offering individual and family health insurance plans in your state. Next, go to US Health Insurance Info to learn about the different types of health insurance plans (Traditional/Copay and HSA Qualified). Find out about the various provider networks that are available (PPO, HMO and POS), the differences between them and how each type effects you. You will also get details about federal health care reform and the current law called the "Patient Protection and Affordable Care Act" (aka: Obamacare). Once you have all of the information from Step 1 above, you are ready to see the specific plans that are available to you. 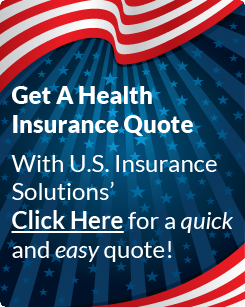 Click on the big box to the right with the U.S. flag background to access our health insurance quote engine. Use the drop down boxes at the top of the quote engine to run multiple different comparisons. You can even estimate whether or not you are eligible for a tax credit subsidy and how much it could be based on your annual income. NOTE: Not all insurance companies have online quoting systems available. If they don't, they won't show up in our quote engine and if they have the best plan for you, you won't know it. So, as noted below in section 4, I encourage you to contact me before applying for a plan. I want to make sure that you know ALL of your options before you pick a health plan. While I will always prefer to talk to you first to make sure you have all your questions answered and that you are getting the best possible coverage for your situation and needs, if you know exactly which company and health plan that you want, you can sign up for that plan by simply clicking the "Apply" button next to that plan in the quote engine. Applying online for a plan without a tax credit subsidy only takes 10 or 15 minutes. We will confirm by email, and keep you informed as your application goes through the approval process. NOTE: If our quote engine doesn't take you to the online application for the plan that you want, please let me know immediately! I will send you an email with an online application website for that company and plan. Are you eligible for a tax credit subsidy? If you want to apply for a plan with a tax credit subsidy, the application process will take longer because you first have to apply for the tax credit subsidy from the federal government before applying for the health plan you want. Additionally, at this time not all plans in all states are set up to let you complete both steps through our online quote engine. Because of this I encourage you to contact me before you apply. I will go through both steps of the process with you by phone and make sure that you are getting the most accurate subsidy and that your health plan application is 100% complete and submitted to the insurance company. If you run into any of the above situations and/or you have ANY other issues or questions along the way, I am here to help! So, please contact me at ANY time! You can call me at the number in the top right corner of this website or send me an email to robtavis@ushealthinsurancesolutions.com. However, the easiest and best way for us to connect is to go to the link above that says CALL ME to schedule a day and time on my online calendar that works best for you. I will call you at that time. Also, please know that whether you sign up directly through my quote engine or with my assistance, I will be your Personal Health Insurance Advisor going forward. That means that if you ever have ANY issues or questions about your health insurance, you will contact me first. I will make sure your questions are answered and issues are resolved. That sure beats dealing with a random customer service person, who doesn't know you or your situation...don't you think? Plus, every year during Open Enrollment (under current law) I will shop the market for you and make sure you have the best plan for the money each and every year. Additionally, at other times of the year if you have a "Qualifying Life Event" that qualifies you for a "Special Enrollment Period," I will also work with you to find the best possible coverage. I encourage you to check out our US Supplemental Coverage area to see the low cost additional coverages that can enhance the value of any health plan for significantly less money than buying a higher "metal level" plan. There are also several free services that can save you money no matter which health plan you have. You will also find information about international travel health plans and a separate section on Concierge medical services. Finally, losing someone you love is AWFUL! I know...I have been through it first hand. I can also tell you first hand that Life Insurance is putting my daughter through college and allowing me to continue doing what I like to do. Make sure YOU have enough in case the unthinkable happens! We work with an outside agency that specializes in life insurance, so you will find the lowest priced term life insurance right here. Go run a free quote on our Life Insurance page right now. Again, thank you for visiting U.S. Insurance Solutions! I look forward to getting to know you and working together on your health insurance. Schedule an appointment to speak to one of our insurance professionals. We love referrals! And thank you even more for your continued business! See the insurance companies offering individual health plans in your state.